We have a new home of our own! 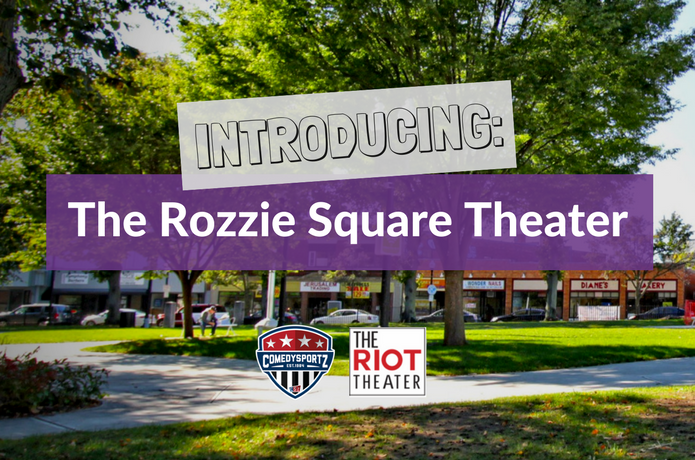 We’re pleased to announce the inception of Rozzie Square Theater, located in the heart of Roslindale Village. On Friday, May 4th, we’ll open our new, bigger theater to the public, located at 5 Basile st. Roslindale, MA. Go ahead and peep that Google street map, you know you wanna. After a fantastic and memorable 3 year run at The Riot Theater in JP, we’ve done what we came here to do: Grow. Not just grow to grow, but grow with intention. We haven’t been shy about our work to bring more improv comedy to the diverse communities that surrounded us on this side of the river - from our Free Open House event in the fall of 2017 to experimenting with different ways to make the benefits of improv more accessible to new audiences, and identifying new friends and partners that share similar goals. By partnering with The Riot to make this new home, we are continuing to grow - sustainably and patiently - toward our vision of making a place we intend to be a centerpiece of the community. Improv and comedy build community in a unique way that few other things can. Rozzie Square Theater and its bathrooms are handicap accessible! The Riot and its director Joseph Gels will be running Improv Jones shows every Saturday, and directing late night Thursday and Friday programming that is still in the works of nailing down. Stay tuned! To kick off our trek to opening weekend, CSz Boston and The Riot are working together to launch Rozzie Square Theater and raise additional funds via an Indiegogo campaign. We would love your help to make this place beautiful and fun for everyone. Whether you live in the community or are helping support from afar, we've got a variety of perks that reward your donation, from tickets and lifetime passes to local business advertising packages. If you’re unable to donate, we hope you’ll help spread the word via word of mouth or on your social channels - help us find folks who are passionate about bringing improv and comedy to communities. Every little bit helps. There are risks with any change. Will current audiences stick with us as we relocate? Will we be able to build new audiences in our new home? We are confident that we have the right team and strategy to not only bring our audiences with us but also firmly build roots in the rapidly growing community of Roslindale, especially with the help of wonderful neighbors like the Roslindale Village Main Streets. And so, we head into April with lots of change on the horizon. We are ready and we are thrilled. Forward, onward, upward. CSz Boston Player Christin Rills requested this photo be part of our announcement. Older PostINCOMING! Seattle vs. Boston this weekend.